What sorts of things qualify as first principles of reasoning and what kind of justification for them can be offered? We think of principles like that of non-contradiction as first principles of reasoning. 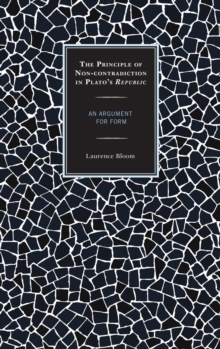 Laurence Bloom argues that Plato's Republic, the first text that affords us a complete statement of the Principle of Non-contradiction, offers us a powerful, complex and detailed argument for taking form-specifically that of the good-as the first principle of both knowing and being.